1. First paragraph is the introduction with details of who, where, what and why and with a hook. 2. Add relevant and interesting detail to each paragraph by using my senses. 3. Use interesting vocabulary that creates a clearer picture for the reader. 'Cheers Big Ears!' I said aloud, grinning from ear to ear. Today at school Max brought me a smoothie that he made with Mrs Cacace. He was learning to follow instructions to make a healthy smoothie and he brought me a glass. What an awesome surprise! As soon as I saw it, I knew that one of the ingredients must be the super vege ' SPINACH' BECAUSE IT WAS A LIME GREEN.....and it looked the same colour as my smoothies I make every morning. When I was a kid, there was a TV cartoon character called Popeye the Sailorman who would down a tin of spinach whenever he needed strength to fight off the baddies. Who'd figure that years later I would be downing spinach too, except there are other ingredients with it like banana and kiwifruit. Wel,l I was supposed to have it for lunch but then Mrs Tamati an ex-teacher at Parkvale came in to see me and the class, and I forgot about my smoothie sitting in the teacher station. So it was again a nice surprise when after school, I peered ito my teacher station and saw that super smoothie sitting there just waiting to be swallowed. 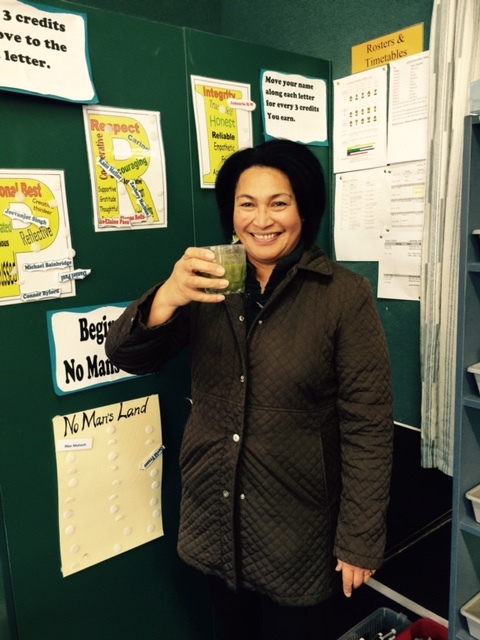 Kathy our cleaner was in the classroom at this stage so I asked her to take a photo of me just before I drank it. Yuuummmm! Cheers Max, I enjoyed that. Well done Mrs Lowe. You hooked me in with "Cheers Big ears'. Your next mission is to add more interesting vocabulary instead of Max brought me maybe Max presented me.